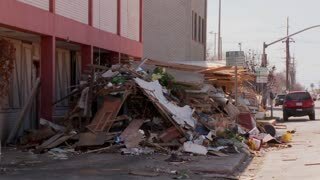 Junk is piled up in the wake of the devastation of Hurricane Ike in Galveston, Texas. Junk and refuse sits on the street during the cleanup after Hurricane Ike in Galveston, Texas. Tilt up of junk and refuse sits on the street during the cleanup after Hurricane Ike in Galveston, Texas.